May 1935 saw the Jubilee of King George V. Sadly, King George only lived another seven months before he died in January, 1936. He had been very ill since late 1920’s, and his son Edward had performed many of his public duties. He spent some time recuperating in Bognor in Sussex, allowing them to change their name to Bognor Regis in his honour. Woburn Sands Council decided to mark the occasion and organised events, costs being met by public subscription. Newport Pagnell Rural District Council supplied medals for the school children. 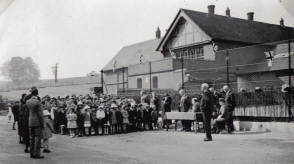 At 9.30am, children received their medals outside Aspley Heath School, on Woburn Road, from Mr S C Hebard. Services were held in St Michaels, Aspley Heath, St Marys Catholic church and the Methodist church in the High Street. A collection at St Michaels for King Georges Jubilee Trust realised £5 7s. The village was decorated with streamers and bunting up and down the High Street. From the Square to the railway station was decorated with flags, and the side streets had banners as well, with “Long May He Reign” and “God Bless our King and Queen”. The thanksgiving that was broadcast live on radio from St. Pauls was played in the Institute Hall, thanks to Ernest Bathurst, the local chemist, who also supplied radiograms. The Woburn Sands Silver Band ( under Mr C. Essen) led, followed by The Guides, then the 62nd Beds Boy Scouts, and Womens Institute in fancy dress of the many costumes of the Empire. Among the decorated icycles was the dairyman Fred Bakers motorbike and side car made to look like a boat. May Bass was Britannia, attended by her knights on her own float. The Reverand Shelton planted an Evergreen Maple tree in the area opposite the Friends Meeting House, by Sandpit Cottage. Rev. Shelton was at St Michaels from 1913 until he died in 1946. His son later served in World War II with the Federated Malay States Volunteer Force, 1st Perak Battalion, and was killed at the fall of Singapore, (alledgedly he was bayoneted after being captured while wearing a civilian shirt.) but there was confusion over his military service eligibility and his name was only added to the Woburn Sands Memorial in 1954. There was a large gymnastics show by the Boy Scouts, under the supervision of Scout Master P. J. Wilson. There was also a sports competition, and thanks to the North Bucks Times, the results of the Sports Day are available for posterity: Girls flat races (5 – 7 years) 1. P. Lunnon, 2. J. Munn, 3. P. Showler. (7 – 11 years) 1. P. Munn, 2. A. Munn, 3. Doreen Hunt and P. Lancaster, dead heat. (11 – 14 years) 1. P Lancaster, 2. L. Holmes, 3. B. Radley. (14 – 16 years) 1. E. Bromage, 2. D Lancaster, 3. M. Jefferson. Boys flat races (5 – 7 years) 1. M. Munn, 2. P. Cottrell, 3. F. Jenkins (7 – 11 years) 1. A. Showler, 2. E. Keens, 3. H. Coleman. (11 – 14 years) 1. S. Theobald, 2. M. Hannah, 3. D. Bromage and G. Bromage, dead heat. (14 – 16 years) 1. A. Watts, 2. G. Codd, 3. R. L. West. Sackrace 1. D. Chambers, 2. C. Munn, 3. P. Lunnon. 100 yds relay race, J. Robinson, D. Barker, T. Higgins and A. Watts. Slow cycle race, 1. J. Holmes, 2. W. Hollier, 3. D. Hill. High jump, 1. E . Kitchener, 2. W. Dolton. Cross country race (2 miles) 1. T. Higgins, 2. J. Robinson, 3. G. Sanders. The Tug-o’war was won by Mr L. Blanshards team. 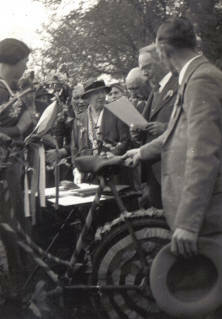 The decorated bicycle parade was won by 1. Norah Elliott, 2. A. Chester, 3. M. Jenkins. Then the Womens Institute gave their Empire Pageant, with each country being presented to Britannia, and an appropriate national song being sung. Children had a special tea in marquee on field, while old age pensions had a little more comfort in the Memorial Hall. With the left over money that had been collected from villages, the Council decided to erect 4 public benches. Two were placed on Woburn Road, one at the top of Aspley Heath, and one in lower part of Station Road. 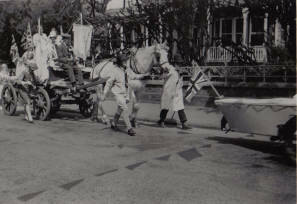 It is possible that it was the Markwell family who took the film these stills came from. Arthur Markwell was a grocer in Woburn Sands, later followed by his son Ernest, in the corner shop by Downham Road. This had originally been a Co-op grocery. Markwell first appears in directories from 1924, and were still there up until after the Second World War. In 1935, houses were numbered for the first time, as previously only names were used, until the Post Office could not cope any longer. It was also the year of the official change of the name of Aspley Lane to Weathercock Lane, much to the disgust of some of the residents! Many thanks to Miss G. Parker for access to her family album for some of these images.